The zBoost REACH ZB560P provides increased in-building voice, 2G and 3G data coverage and better reach into rural environments by using a directional External Antenna which is aimed at the nearest network tower. Wi-Ex ZB560P boosts cell phone signals for voice calls and text for all major carriers. The zBoost REACH captures the marginal to reliable cellular signal you have outdoors and rebroadcasts it indoors, up to 3,500 square feet, so you can enjoy clearer, faster service without interruption. 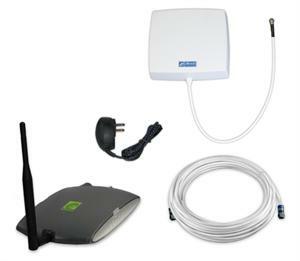 zBoost ZB560P signal booster is backed by a 2 year Manufacturer’s Warranty Replacement. zBoost ZB560P Includes: amplifier base unit, indoor antenna, power supply, 50 ft. of RG6 cable, external panel antenna, and mounting hardware. SureCall FlexPro 3G signal booster for hone and small office. SureCall FlexPro dual band signal boosters work with all major U.S. carriers. FCC Certified for new rigid protection standards.